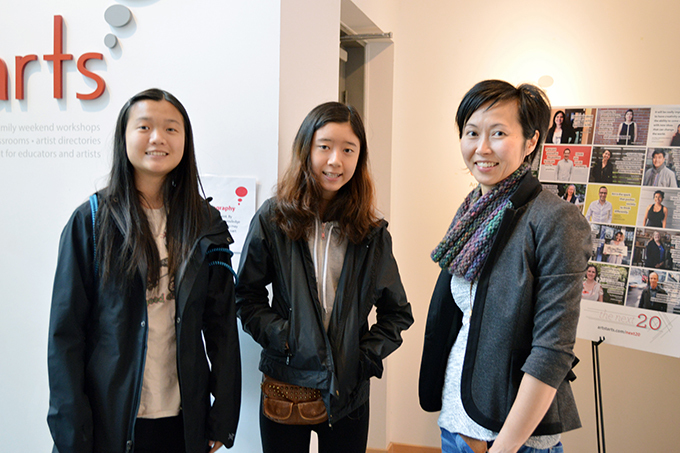 Guest blogger Vanessa Lam is a Public Health Dietitian who works to build a greater connection to food to support student learning and health in Vancouver schools. 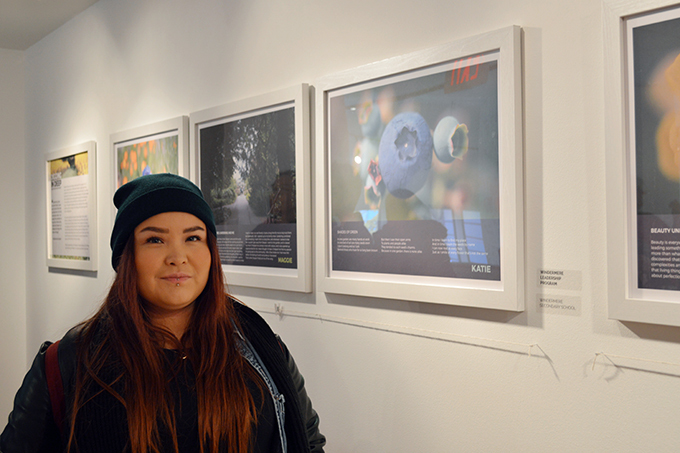 Vanessa shares her experiences about how the youth Photovoice project Digging in Deep took root and blossomed. This project is now on display in the ArtStarts Mezzanine Gallery. 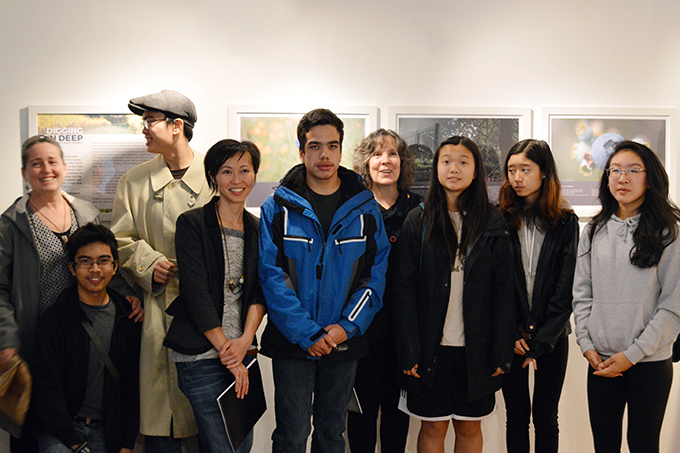 On Sunday, November 6, we celebrated the exhibition opening—check out photos from the event below and on Facebook. Working with school and community partners, my colleague Kathy Romses and I heard that food and garden activities affected students in many ways within and beyond the classroom. Students were spending time in the school garden on their own and some felt it was a safe place to be in. It gave us a sense that food and gardening were important to youth—but none of these comments were ever documented anywhere. We found that Photovoice was an innovative way to capture youth perspectives. It is a research method which youth would share their personal experiences through photography and writing. With the support of a Vancouver Coastal Health Research Institute Research Challenge grant funded by the Robert N. Ho Patient Care Fund, Kathy and I initiated a research project. 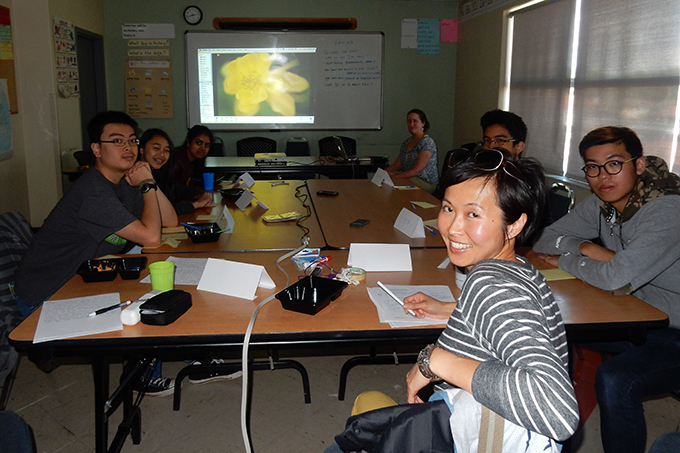 I was excited to involve Vancouver youth as co-researchers to explore the connections between food, gardening and mental well-being. The grant allowed us the opportunity to combine health research with art in working with Photovoice artist Christine Germano. With her experience in engaging youth through photography and storytelling she helped facilitate a series of photography and writing sessions with secondary school youth. Kathy and I gathered school and community partners together to plan how to encourage youth participation in our project. Christine and I introduced the project with youth clubs and groups to seek out youth volunteers as suggested from our partners. Christine, Kathy and I then met with youth after school as well as on a separate group tour and photography outing at the UBC Botanical Garden. Each session combined some writing with photography. The youth would work on writing a story or poem as well as take photos that would reflect their writing. Part of the sessions also included time with Christine to review their photos to build on the youth's technique and composition skills. 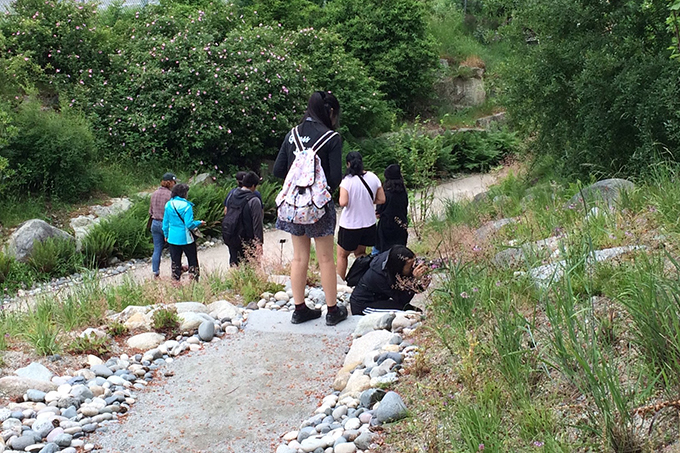 The photos were taken mainly at the school or community garden but other youth chose other sites in their neighbourhood that better reflected their story. What I noticed is that the youth expressed a greater awareness of their surroundings as they became more skilled at observation through using the camera. These sessions were a key part of getting to know the youth and building a trusting relationship. Photography and writing gave youth the opportunity for personal reflection and to make connections with relevant issues and people around them. The youth participated in individual interviews as well as two focus groups. During the first focus group, the youth shared their final photo and shared the story behind the image. Afterwards, Kathy and I reviewed all the interviews, focus group discussion and student writing to determine common themes. At the second focus group, we shared these themes on Post-It notes and asked youth for their feedback. The youth added in missing themes and arranged them using a mind-map format, drawing lines to show the relationships between the identified themes. 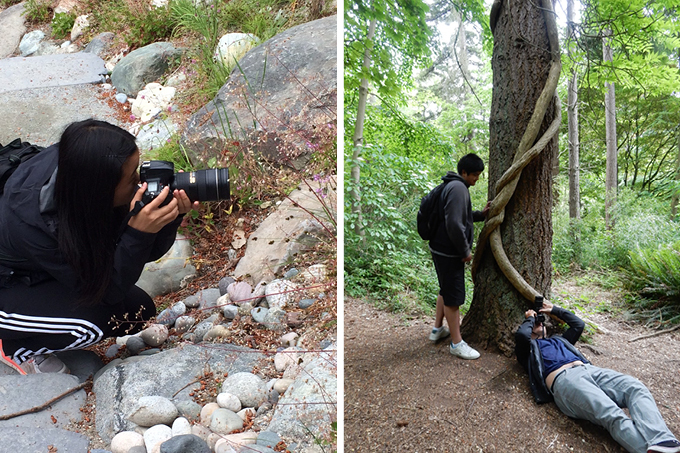 These activities involved youth as co-researchers in the Photovoice research project. Some of the youth didn't realize that they would enjoy gardening as they didn't have the chance to try it before. Others felt closer ties with their friends and family as well as a stronger connection to nature. Cooking and gardening were skills that they felt were important for life. Photography and writing in this project provided a creative outlet for youth and gave them a voice to express their point of view. I am very grateful to be able to partner with ArtStarts in Schools to share the outcome of our project. My gratitude extends to Christine Germano and all the community and school partners whose support was essential to building and carrying out our project. 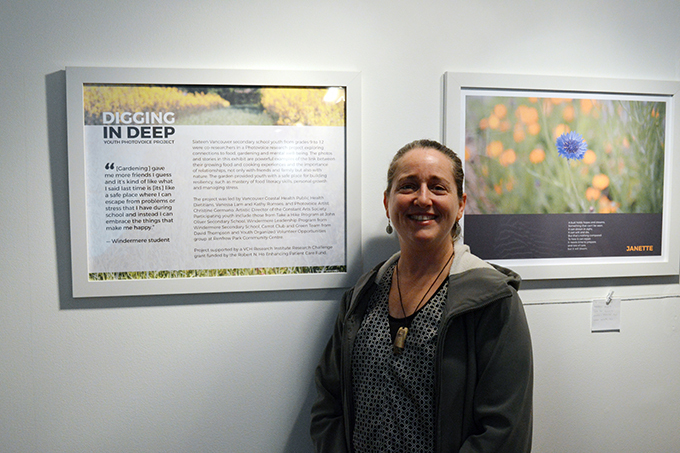 Learn more about Digging in Deep and visit the ArtStarts Mezzanine Gallery in downtown Vancouver to see the project in person. Admission is free and all ages are welcome.